This combination of a Theory flap pocket blazer and navy plaid skinny pants is effortless, chic and oh-so-easy to imitate! Wearing a pair of black leather pumps is an easy way to add some flair to your look. For a polish-meets-cool outfit, consider teaming a Theory Flap Pocket Blazer from farfetch.com with a white lace sheath dress — these items go nicely together. If you're in search of a casual yet stylish outfit, choose a Theory flap pocket blazer and white flare jeans. Both garments are totally comfy and will look fabulous together. Polish off the ensemble with white leather loafers. If you're searching for a casual yet totally chic getup, pair a Theory flap pocket blazer with navy and green plaid skinny pants. Both garments are totally comfy and will look fabulous together. Black suede ballerina shoes will add some edge to an otherwise classic getup. A Theory Flap Pocket Blazer and khaki dress pants are the kind of a fail-safe combination that you so desperately need when you have no extra time. A pair of white leather pumps integrates really well within a myriad of looks. 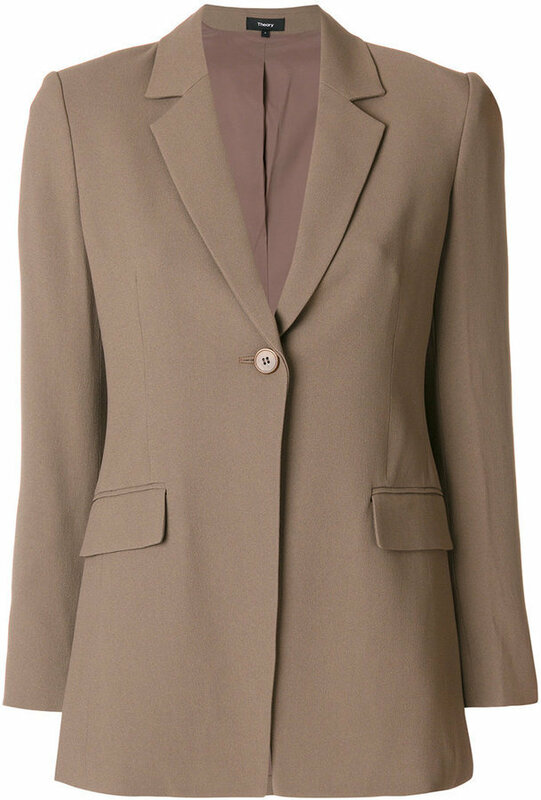 This combo of a tan blazer and charcoal leggings is a safe and very stylish bet. The whole look comes together brilliantly when you throw in a pair of white low top sneakers. If you're hunting for a casual yet absolutely chic ensemble, marry a Theory flap pocket blazer from farfetch.com with navy skinny jeans. Both pieces are totally comfy and will look fabulous together. You could perhaps get a little creative in the footwear department and elevate your ensemble with brown suede ankle boots. This pairing of a tan blazer and a beige jumpsuit is the perfect foundation for a great number of stylish ensembles. Get a little creative when it comes to footwear and smarten up this getup by finishing with a pair of black leather heeled sandals. For something more on the casually cool end, opt for this combination of a tan blazer and blue skinny jeans. And if you need to effortlesslly perk up this ensemble with one single item, add a pair of tan leather heeled sandals to the equation.